This week a young man asked me, "Does water affect weight?" After some digging, I realized he has been observing his mother use one of the 45 Day Plans to lose weight / get fit and this program requires the user to drink more water than they normally would - up to 3-4 quarts a day!! Most people do not drink enough water in a day PERIOD. The Mayo Clinic states, "Water is your body's principal chemical component, making up, on average, 60 percent of your body weight. Every system in your body depends on water. For example, water flushes toxins out of vital organs, carries nutrients to your cells and provides a moist environment for ear, nose and throat tissues. Lack of water can lead to dehydration, a condition that occurs when you don't have enough water in your body to carry out normal functions. Even mild dehydration can drain your energy and make you tired. The Institute of Medicine advises that men consume roughly 3 quarts (about 13 cups) of total beverages a day and women consume 2.2 quarts (about 9 cups) of total beverages a day. Total beverages mean water and other drinks as well. As with most things in health / nutrition and exercise, there is always some study that disproves another study. 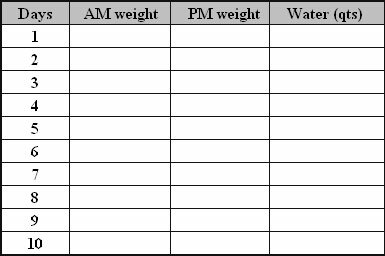 Daily Weight Gain - By drinking more water per day, you will have a series of weight gains throughout the day as a quart (32 oz) of water weighs two pounds. So, as I write this article and sip from my 32 oz glass, I will gain two lbs in the next 90 minutes. Now, I will likely be interrupted by Mother Nature and lose 1-2 lbs from the previous 32 oz glass of water I drank after my early workout. The easy answer is yes - drinking water does affect weight significantly enough to be seen on a scale immediately. Usually, in a 24 hour period, you will cycle through this process of gaining water weight and losing water weight and have either a net loss or stable weight for the day. What About Weight Loss? - Here is where I came up with the saying - "Want to Lose weight? - Just Add Water!" Adding more water to your diet will help you lose weight a few ways. ONE - hunger suppressant - you will not be as hungry when drinking water through the day as your stomach will constantly have something flowing through it. TWO - when your body realizes it is getting enough water, it will allow you to release retained waters from your cells through digestion. I had a client who lost 20 pounds in one week after adding JUST water to his diet. He was so bloated, his rings did not fit him, stomach was large, and socks would indent his lower legs when he removed them. Have you ever felt bloated, hands and feet puffy, belly extended - well this is your body holding onto water. This could also be a symptom of a variety of medical issues so alerting your doctor is never a bad idea when bloated for long periods of time with no relief. But it is also easily removed by adding water if you are just bloated due to dehydration or high sodium diet. Replacement of water lost - Humans sweat, digest, and breathe. All three are processes that help our bodies to expel water. These fluids should be replaced and depending on your activity level and environment, your replacement maybe significantly different that someone with a different lifestyle. Regardless, everyone needs water. The amazing thing about the human body is that it is capable of pulling water out of every piece of food we eat. So by eating, you can actually survive and have enough water in your body to excrete toxins, sweat (some), and breathe. You can also lose significant weight through sweating (like wrestlers cutting weight). This is not healthy as you are also losing vital electrolytes that is not replaced will negatively affect performance and could cause death. However, what performance fitness experts agree on is that additional water will help us perform better by staving off dehydration, overheating, and even heat stroke. A common formula is to take 1/2 to 2/3 of your bodyweight in pounds and replace that many ounces of water in a 24 hour period. For instance, I am 200lbs so I typically get 100 oz of water a day - especially after exercise. Too much water - How much is too much? I tackled this one a few years ago when a water drinking contest on the radio actually caused someone to die from water intoxication. That person had downed nearly two gallons within a short period of time (less than 2 hours). This caused her body to shut down causing kidney failure as well as electrolyte imbalances that affect all organ function. Many endurance athletes have died from the same issues, however they sweat profusely and re-hydrated with ONLY water and had the same electrolyte imbalances that caused death. When drinking water after sweating profusely, you should consider foods or supplements with electrolytes (sodium, potassium, etc) so that does not happen. I like to eat a can of chicken noodle soup after a workout where I lose 5-7 lbs of water through sweating - it can happen in humid or arid environments. The chicken noodle soup (especially kids double noodle style) can offer several hundred milligrams of sodium and potassium - much more than sports drinks. Try adding 2-3 quarts a day for men and 1-2 quarts a day for women and let's see what happens!!! NOTE - if you are already consuming the above amounts there is no need to try this 10 Day Challengeor add more water to your diet.